Indianapolis, Indiana – Plaintiff Delicato Vineyards of Manteca, California filed a lawsuit in the Southern District of Indiana alleging trademark infringement and other wrongdoing. Defendant is Gnarly Grove Cider Co. of Columbus, Indiana. Plaintiff Delicato claims ownership to two trademarks, U.S. Trademark Registration No. 3165707 for GNARLY HEAD, and U.S. Trademark Registration No. 4777145 for a design trademark. 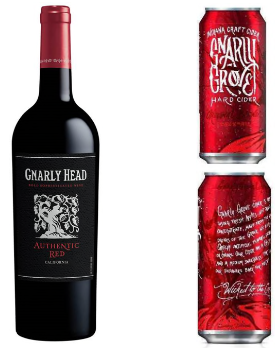 It offers Gnarly Head wine products for sale using these trademarks. Defendant Gnarly Grove recently launched Gnarly Grove hard cider. Plaintiff contends that both the name and the trade dress of this product are confusingly similar to its Gnarly Head wine. It asserts that the similarities appear to be an intentional effort on the part of Defendant to capitalize on the reputation of the GNARLY HEAD brand. Plaintiff is seeking equitable relief, damages, costs and attorneys’ fees. The case was assigned to District Judge Tanya Walton Pratt and Magistrate Judge Denise K. LaRue in the Southern District and assigned Case No. 1:16-cv-02932-TWP-DKL.